Last we heard of our heroic Analander, at the end of the second chapter of the series, he had already crossed the perilous Shamutanti Hills near his homeland and had survived the more insidious dangers of the Cityport of Thieves. We find him again, in Sorcery! Part 3: The Seven Serpents, at the midpoint of his journey to the fortress of Mampang where the evil Archmage awaits him for their final confrontation. 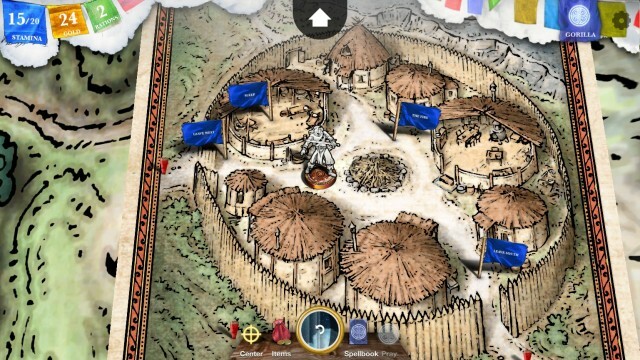 Despite their brisk release schedule, the latest installment’s release coming a mere two months after its predecessor’s, Inkle have introduced a number of innovations to revitalize the stale gamebook formula. The trend had already been apparent in the move from the linear, plodding first part to the more complex urban interactions of the second, but here, the creativity on display is nothing short of impressive. Having left the intrigue of Khare behind, we resume control of the Analander as he enters the Baklands, a desolate assemblage of swamps, deserts and steppes presenting a far more dangerous range of wilderness challenges than the ones we had to face in the introductory chapter. The aim is to reach the southeastern corner of the map where the path to Mampang begins. The main obstacles, apart from all the roving goblin bands, giant burrowing insects, and flocks of shrieking harpies, are two unscalable mountain ridges blocking your easterly progress. Or, so they seem to be doing, until Sorcery comes up with a twist straight out of A Link to the Past. In each area, there is a tower with a massive, telescope-like apparatus on its roof. After locating and activating those devices, they start to emit a magical beam that may be directed to different sections of the map. Locations touched are taken decades back in time: lonely shores become bustling fishing villages; fetid marshes turn into majestic forests; monuments previously lying in rubble stand proudly intact. Controlling the beam via mouse is a pleasantly hands-on affair in a game where most interactions are limited to a multiple-choice template, but by far the most important effect that the telescopes have on the experience is how they erase any notion of linearity one would normally associate with the genre. Inkle has embellished its two intertwined worlds with a staggering amount of content, made more impressive by the dynamic, complex nature of their connection. Areas already visited do not just provide new exploration opportunities but, on several occasions, information or items gained in the Baklands of the past will provide insights and solutions in the present. The sense of a living world, one that reacts to and changes as a result of your choices, is almost uncanny in the context of the inherent limitations of the format. Characters will remember and comment on your actions, whole histories, some tragic, others comical, will play out in the multiple visits of a single location, and there are various quasi-random events and subtle, contextual clues suggesting that every choice you make has an effect and every action a repercussion. I haven’t played the book version, but one has to assume that the impression owes much to Inkle’s playful tampering with the formula, as it’s impossible to imagine some of their design choices being applicable in a static book format. Naturally, Sorcery! 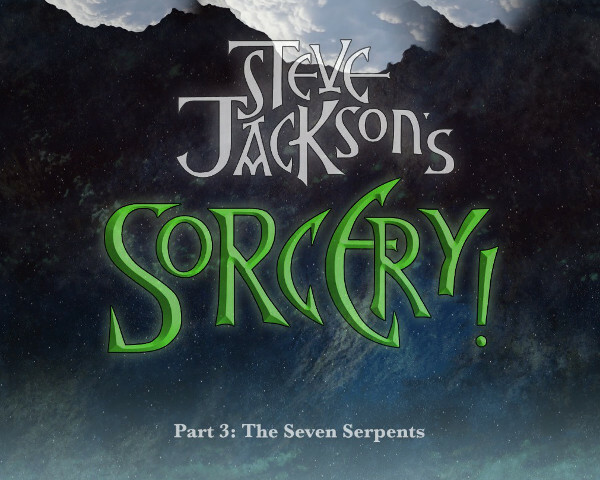 Part 3: The Seven Serpents is not just about finding a way to traverse the Baklands past and present. A great hero needs a great antagonist; a greater one needs seven. While you are wandering through time and space, the Archmage’s magical messengers, the Seven Serpents, are racing to reach his fortress and inform him of your progress. Fortunately, they seem to be as confused as yourself by the spatiotemporal irregularities of the Baklands, which means that you may track them down and destroy them. Much of the third part of Sorcery revolves around gathering information about the location and weaknesses of these deadly opponents from the, not always keen to help, NPCs you encounter in both timelines. The social gambling of Swindlestones makes a welcome return from Part 2, but there are other, numerous opportunities to converse with a wide range of characters and persuade them to impart some of their potentially life-saving knowledge to you. The Serpents can be defeated even without knowing their weaknesses, but they present a much tougher challenge, and it’s possible to even complete the chapter without killing them all, though this will presumably have dire consequences by the time the Analander reaches Mampang in the fourth installment. There are flaws in Sorcery! Part 3: The Seven Serpents, but they are mostly minor and already familiar from the previous chapters; the numbing sense of security provided by an overcompensating rewind mechanic; the exploitable healing powers of the spirit animals; the fact that your Swindlestone opponents seem entirely incapable of grasping the concept of bluffing. But Inkle has done a fantastic job of addressing a more serious set of issues, one that seemed inherent to the series: it has gone beyond the static gamebook format to create a living, breathing fantasy world.